Sakura is three braids, two 8 element kongo gumi beaded braids and one 16 element sakura flat braid. The beaded braids are made with 11/0 seed beads, freshwater pearls, and Swarovski crystals. The beads were strung on three sizes of S-Lon/C-Lon cord; Tex 70/micro for the pearls, Tex 135/fine for the 11/0 seed beads, and Tex 210/bead for the crystals. The non beaded braid is made with Phoenix King Tut cotton yarn. 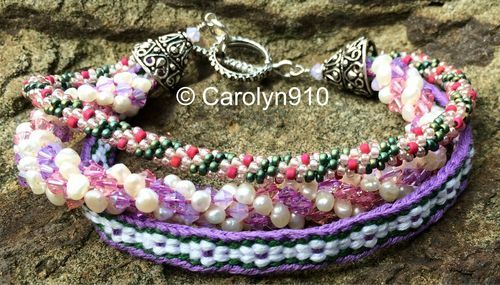 Created in 2014 for Crystal Bead Bazaar's Bracelet Challenge.